I’m lucky to live in a lovely apartment, on a great block in Brooklyn, with tons of character — and appliances that may be older than I am. They all work, if you know how to finesse the quirks, but they’re certainly not fancy, and they look kinda rough. And, until recently, I just assumed that the grey film and rusty marks inside my dishwasher were just part of its character, too. 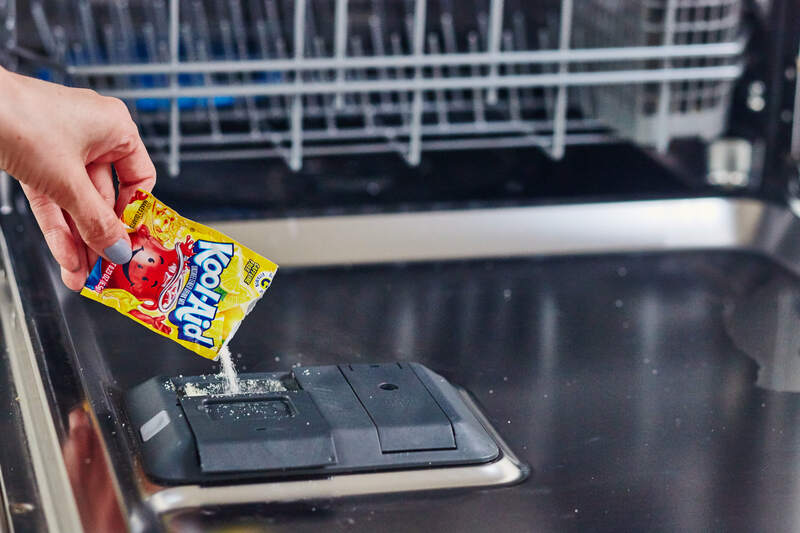 When I first heard of the trick to use powdered Lemonade Kool-Aid to clean the dishwasher, I was skeptical, to say the least! 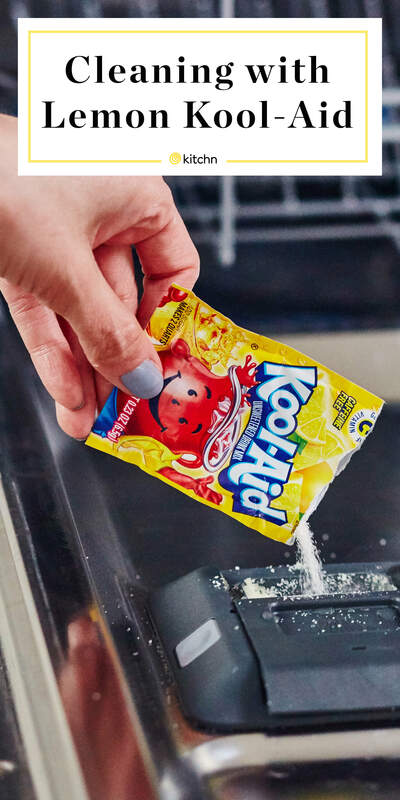 The premise is that the citric acid in the lemonade (and it has to be the unsweetened kind, and not another flavor) is strong enough, especially combined with the hot water going through your dishwasher, to lift those stains right off. Yeah, right, I thought. But my family likes lemonade, so it seemed like it was worth a trip down the aisle — I could get a few packs for less than five bucks. My grocery store had many enticing flavors of powdered Kool-Aid. I spent several minutes eying the unsweetened orange option (which also lists citric acid among its first three ingredients) and a pink lemonade, but stuck to the original. Because I follow directions. And I didn’t want to end up with a pink dishwasher. To start, I emptied the dishwasher. You want the mixture to be able to reach every nook and cranny in its interior, and I was worried about what that citric acid would do to the kids’ melamine plates and my crystal glassware (which, I know, is not supposed to be in the dishwasher in the first place). Then, I put a single packet’s worth of lemonade powder into the detergent area, closed it, and started the dishwasher. I turned it to the glassware setting because I was too excited to wait for the full “normal” cycle to go through. And then, I waited. About 45 minutes later, I opened the dishwasher … and the rust stains and gray film were still there. I was disappointed. But! I figured the lemonade cleanse might have loosened everything up, so I got my scrubby sponge to check — and literally every grungy spot on my dishwasher wiped clean. Rust spots, gone! Lime deposits, gone! Mildewy bits, gone! It took maybe two minutes of light scrubbing and the interior of my dishwasher actually looks like new. I didn’t even know it could get that clean — I’d just assumed it was beyond hope! My conclusion: It worked! In an older dishwasher, at least, you can’t expect miracles to appear on their own, but with a little elbow grease, that combination of citric acid and super-hot water can get your dishwasher looking squeaky clean! Now I just have to decide if we should drink the other packets or if I should move them to the cleaning closet. Have you tried this? Would you try it? !